Powered By: MedPB, LLC. Copyright © 2019. Are new types of aids available? A hearing aid is a small electronic device that you wear in or behind your ear. It makes some sounds louder so that a person with hearing loss can listen, communicate, and participate more fully in daily activities. A hearing aid can help people hear more in both quiet and noisy situations. However, only about one out of five people who would benefit from a hearing aid actually uses one. A hearing aid has three basic parts: a microphone, amplifier, and speaker. The hearing aid receives sound through a microphone, which converts the sound waves to electrical signals and sends them to an amplifier. The amplifier increases the power of the signals and then sends them to the ear through a speaker. A hearing aid magnifies sound vibrations entering the ear. Surviving hair cells detect the larger vibrations and convert them into neural signals that are passed along to the brain. The greater the damage to a person's hair cells, the more severe the hearing loss, and the greater the hearing aid amplification needed to make up the difference. However, there are practical limits to the amount of amplification a hearing aid can provide. In addition, if the inner ear is too damaged, even large vibrations will not be converted into neural signals. In this situation, a hearing aid would be ineffective. If you think you might have hearing loss and could benefit from a hearing aid, visit your physician, who may refer you to an otolaryngologist or hearing care professional. An otolaryngologist is a physician who specializes in ear, nose, and throat disorders and will investigate the cause of the hearing loss. A hearing care professional is a hearing health professional who identifies and measures hearing loss and will perform a hearing test to assess the type and degree of loss. There are three basic styles of hearing aids. The styles differ by size, their placement on or inside the ear, and the degree to which they amplify sound (see the following illustration). Behind-the-ear (BTE) hearing aids consist of a hard plastic case worn behind the ear and connected to a plastic earmold that fits inside the outer ear. The electronic parts are held in the case behind the ear. Sound travels from the hearing aid through the earmold and into the ear. BTE aids are used by people of all ages for mild to profound hearing loss. Canal aids fit into the ear canal and are available in two styles. 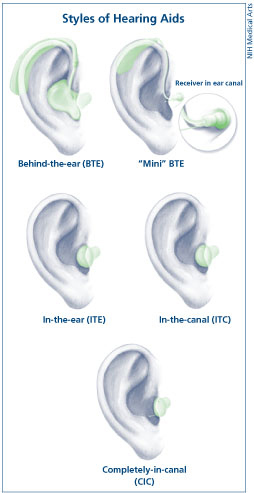 The in-the-canal (ITC) hearing aid is made to fit the size and shape of a person's ear canal. A completely-in-canal (CIC) hearing aid is nearly hidden in the ear canal. Both types are used for mild to moderately severe hearing loss. Because they are small, canal aids may be difficult for a person to adjust and remove. In addition, canal aids have less space available for batteries and additional devices, such as a telecoil. They usually are not recommended for young children or for people with severe to profound hearing loss because their reduced size limits their power and volume. Analog aids convert sound waves into electrical signals, which are amplified. Analog/adjustable hearing aids are custom built to meet the needs of each user. The aid is programmed by the manufacturer according to the specifications recommended by your Audiologist. Analog/programmable hearing aids have more than one program or setting. An Audiologist can program the aid using a computer, and the user can change the program for different listening environments – from a small, quiet room to a crowded restaurant to large, open areas, such as a theater or stadium. Analog/programmable circuitry can be used in all types of hearing aids. Analog aids usually are less expensive than digital aids. Digital aids convert sound waves into numerical codes, similar to the binary code of a computer, before amplifying them. Because the code also includes information about a sound's pitch or loudness, the aid can be specially programmed to amplify some frequencies more than others. Digital circuitry gives an Audiologist more flexibility in adjusting the aid to a user's needs and to certain listening environments. These aids also can be programmed to focus on sounds coming from a specific direction. Digital circuitry can be used in all types of hearing aids. The hearing aid that will work best for you depends on the kind and severity of your hearing loss. If you have a hearing loss in both of your ears, two hearing aids are generally recommended because two aids provide a more natural signal to the brain. Hearing in both ears also will help you understand speech and locate where the sound is coming from. You and your Audiologist should select a hearing aid that best suits your needs and lifestyle. Price is also a key consideration because hearing aids range from hundreds to several thousand dollars. Similar to other equipment purchases, style and features affect cost. However, don't use price alone to determine the best hearing aid for you. Just because one hearing aid is more expensive than another does not necessarily mean that it will better suit your needs. A hearing aid will not restore your normal hearing. With practice, however, a hearing aid will increase your awareness of sounds and their sources. You will want to wear your hearing aid regularly, so select one that is convenient and easy for you to use. Other features to consider include parts or services covered by the warranty, estimated schedule and costs for maintenance and repair, options and upgrade opportunities, and the hearing aid company's reputation for quality and customer service. Can the Audiologist make adjustments and provide servicing and minor repairs? Will loaner aids be provided when repairs are needed? What instruction does the Audiologist provide? Become familiar with your hearing aid's features. With your Audiologist present, practice putting in and taking out the aid, cleaning it, identifying right and left aids, and replacing the batteries. Ask how to test it in listening environments where you have problems with hearing. Learn to adjust the aid's volume and to program it for sounds that are too loud or too soft. Work with your Audiologist until you are comfortable and satisfied. My hearing aid feels uncomfortable. Some individuals may find a hearing aid to be slightly uncomfortable at first. Ask your Audiologist how long you should wear your hearing aid while you are adjusting to it. My voice sounds too loud. The “plugged-up” sensation that causes a hearing aid user's voice to sound louder inside the head is called the occlusion effect, and it is very common for new hearing aid users. Check with your Audiologist to see if a correction is possible. Most individuals get used to this effect over time. I get feedback from my hearing aid. A whistling sound can be caused by a hearing aid that does not fit or work well or is clogged by earwax or fluid. See your Audiologist for adjustments. I hear background noise. A hearing aid does not completely separate the sounds you want to hear from the ones you do not want to hear. Sometimes, however, the hearing aid may need to be adjusted. Talk with your Audiologist. Although they work differently than the hearing aids described above, implantable hearing aids are designed to help increase the transmission of sound vibrations entering the inner ear. A middle ear implant (MEI) is a small device attached to one of the bones of the middle ear. Rather than amplifying the sound traveling to the eardrum, an MEI moves these bones directly. Both techniques have the net result of strengthening sound vibrations entering the inner ear so that they can be detected by individuals with sensorineural hearing loss. A bone-anchored hearing aid (BAHA) is a small device that attaches to the bone behind the ear. The device transmits sound vibrations directly to the inner ear through the skull, bypassing the middle ear. BAHAs are generally used by individuals with middle ear problems or deafness in one ear. Because surgery is required to implant either of these devices, many hearing specialists feel that the benefits may not outweigh the risks. Hearing aids are not always covered by health insurance companies, but sometimes they are. Some nonprofit organizations provide financial assistance for hearing aids, while others may help provide used or refurbished aids. Another promising research focus is to use lessons learned from animal models to design better microphones for hearing aids. NIDCD-supported scientists are studying the tiny fly Ormia ochracea because its ear structure allows the fly to determine the source of a sound easily. Scientists are using the fly's ear structure as a model for designing miniature directional microphones for hearing aids. These microphones amplify the sound coming from a particular direction (usually the direction a person is facing), but not the sounds that arrive from other directions. Directional microphones hold great promise for making it easier for people to hear a single conversation, even when surrounded by other noises and voices.